A community with its non-king environment is called ecosystem. Odum, E.P. ( 1959) defines ecosystem as an area of nature, that includes living organism and nonliving substances, interacting to produce an exchange of materials between the living and nonliving parts. Non-living environment provides energy raw materials and space to the living organism. They use these materials for their growth and development. Abiotic component include basic elements and compounds of the environment like soil, water, gases. It is also composed of minerals like carbonates, phosphates etc. It also has variety of organic compounds. It also includes physical factors like moisture, wind, currents and solar radiation. Solar energy is the source of energy for the entire ecosystem. 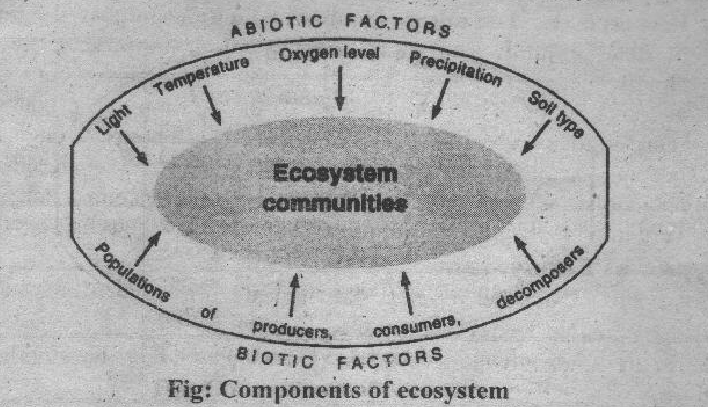 The living components of the ecosystem are called biotic components. There are further divided into two main parts. i.e. Autotrophs or Producers and Heterotrophs or Consumers. (a) Autotrophs or producers: They are able to fix light energy and manufacture food from simple inorganic substances. They mainly consist of green plants. Sonic floating microscopic photosynthetic organisms are also present They are called phytoplanktons. Primary consumers: They are purely herbivorous animals. They include large animals or macroconsumers like many insects, mouse, rabbits, goat sheep. deer, birds etc. These are the common herbivorous of terrestrial ecosystem. Protozoa small molluscs and Crustaceans and fishes are herbivores of the aquatic ecosystem. It includes rotifers, protozoans and crustaceans. They live only on phytoplankton or microscopic plants. Secondary Consumers: It includes carnivores and omnivores. Carnivores are the flesh eating animals. The get their energy fry eating herbivores. Carnivores include some insects and other large animals like cats, dogs, snakes, fox, eagle etc. Some organism can derive their energy from both plants and animals. They are known as omnivores. Ants, crow, sparrow. hen, bear and man are omnivores. 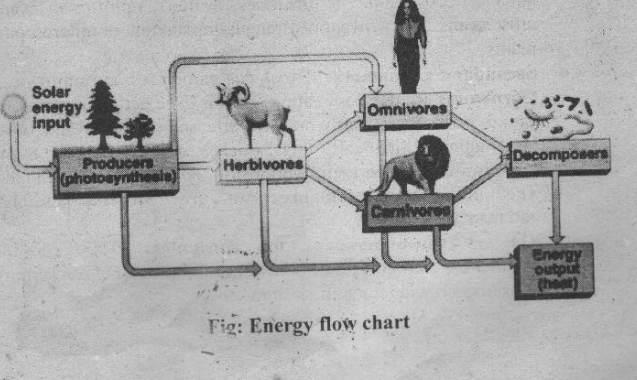 Tertiary Consumers: or top consumers: They eat the herbivores, carnivores and omnivores for their energy. Tertiary consumers I include lion, tiger, hawk etc. Decomposers: The microrganisms which decompose the bodies of dead animals and plants are called decomposes. They are chiefly bacteria and fungi. They breakdown the complex component and’ protoplasm. They absorb some of the decomposed product and release minerals back into the ecosystem. These minerals once again become available to the producers. The dead material will accumulate without the decomposers. Thus the decomposers play a very important role in recycling of compounds in the ecosystem.Types of EcosystemEcosystems are divided into the following categories. Marine Ecosystem: They consists of deep water bodies, like oceans, estuaries etc. Fresh Water Ecosystem: They consists of lotic or running fresh water; like stream or rivers, and lentic-standing water like pond, lake etc. Terrestrial Ecosystem: They include forest grassland, desert etc. Artificial Ecosystems: In these types of Ecosystem, natural balance is disturbed by man and balance is maintained by him. Artificial ecosystem consists of roan made forest, orchards, cultivated fields etc.